This post is sponsored by Oriental Trading Company. I love making the holidays special for my kids. 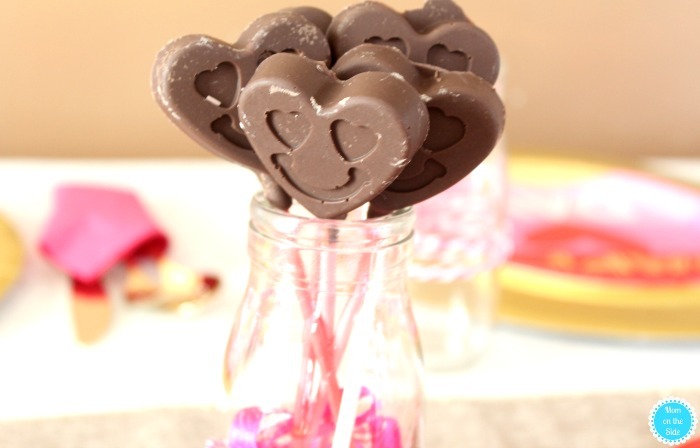 While Valentine’s Day isn’t one I go overboard on, I do like surprising the kids with a little extra love. 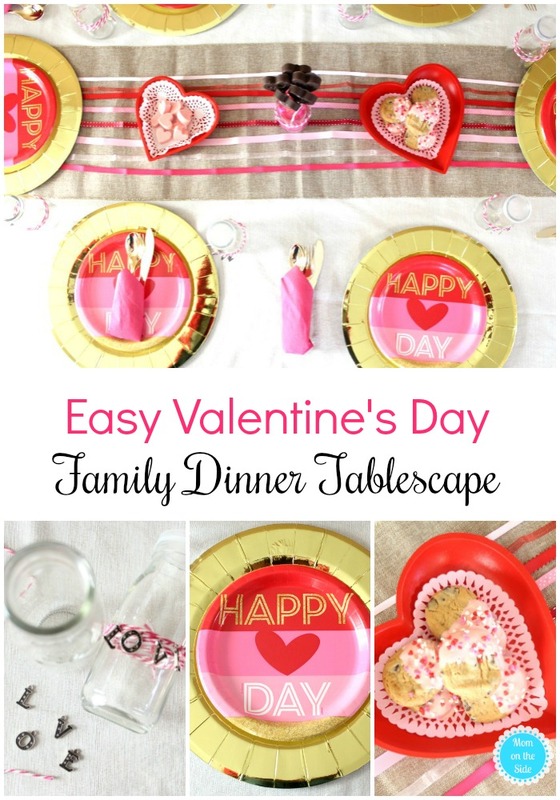 Small candy gift bags for the kids and a simple Valentine’s Day Family Dinner Tablescape. It adds a fun touch to the day without a lot of work and that’s something that I love. First, I have to tell you how excited I was that my DIY Love Bottles turned out exactly as I pictured them in my head. That doesn’t happen often and this is an idea I will be using for other holidays as well. Not only is it festive to drink out of but the kids loved having charms to keep afterward. 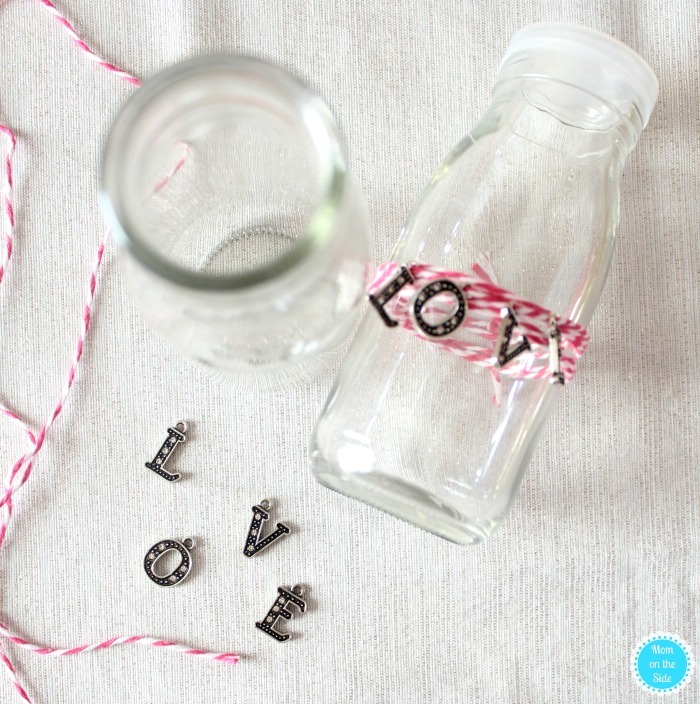 To make the DIY Love Bottles I used milk bottles, pink striped twine, and letter charms. Simply tie the twine around the bottle a couple of times and tie a knot. 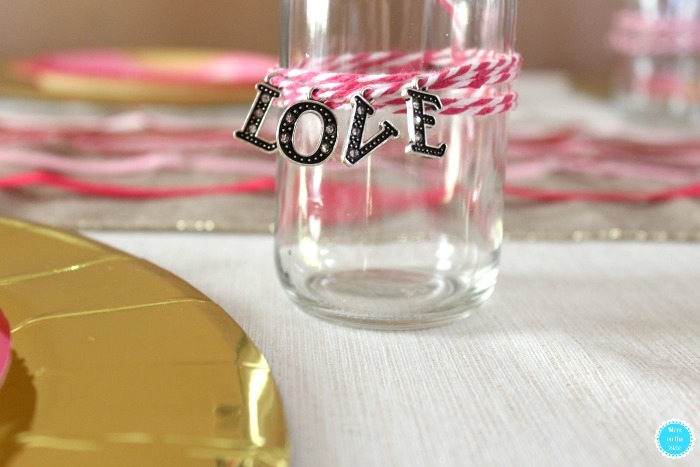 String the letter charms on one strand and tie them around again to keep the charms from sliding. To finish, cut off any excess twine and adjust the letters. Table runners are an addiction of mine. There is always one on our dining room table and I can’t resist holiday themed ones. This time around I used a Gold Glitter Table Runner and placed Craft Ribbon across the top of it. Oh and those cookies, SO delicious! 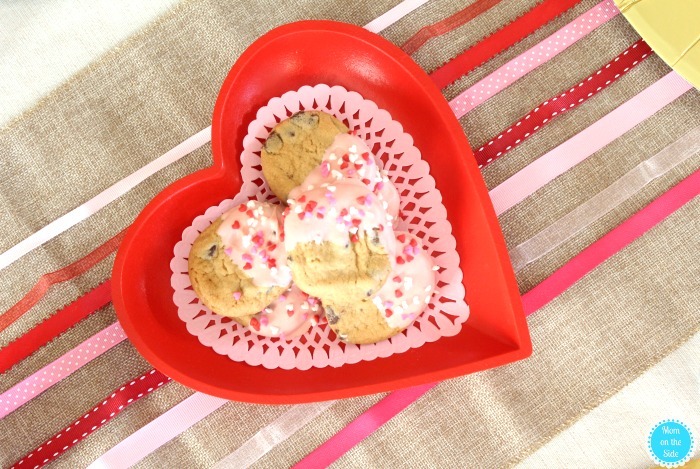 I took store-bought chocolate chip cookies and dipped half of them in strawberry flavored chocolate. Tossed on some heart shaped sprinkles before they cooled and that’s it. 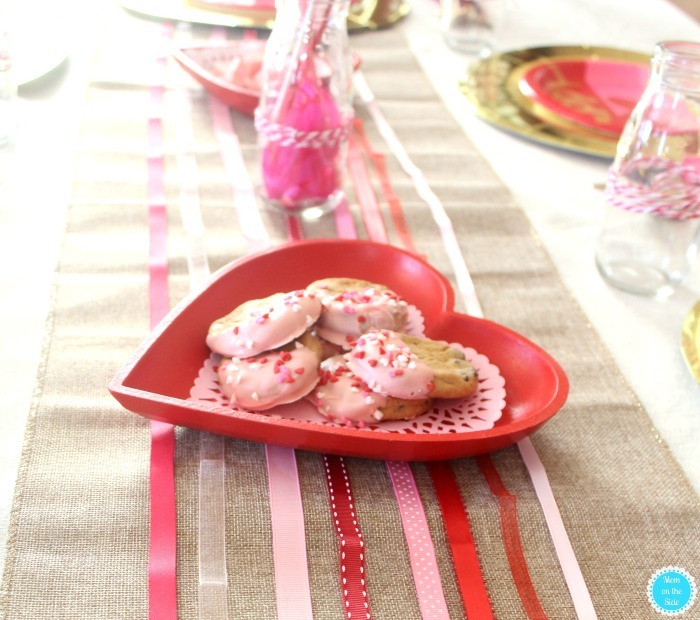 Heart Nesting Trays with Doilies inside was the perfect way to serve them and decorate the table at the same time. Oriental Trading has lots of colors and designs for party supplies. 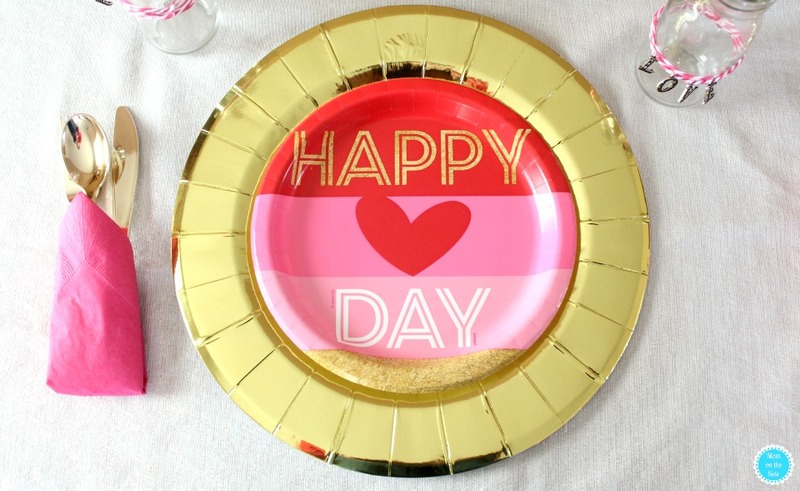 I fell in love with the Happy VDay Plates I placed on top of Gold Chargers. The kids fell in love with their “fancy” gold plastic silverware – it was a riot hearing them chatter about the fanciness! All in all, everything turned out amazing and it took me less than 30 minutes to set it all up! 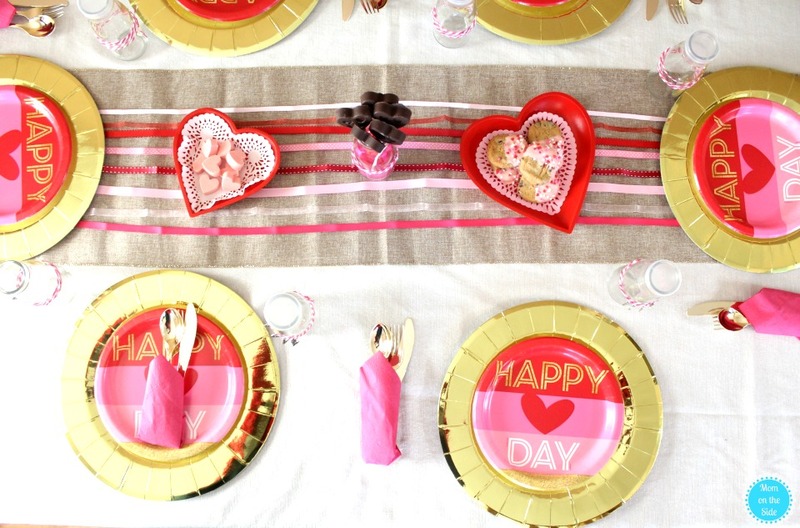 If you are planning a simple Valentine’s Day dinner at home with your family you can make it extra special with Valentine’s Day tableware and decor at OrientalTrading.com.